Bouagnon was signed to the Jets' practice squad Tuesday. Analysis: The Northern Illinois product has spent time with both the Green Bay and Detroit practice squads this season, and found a new home Tuesday. Bouagnon hasn't taken an NFL regular season snap in his career so he likely won't provide any fantasy value this season. The Lions signed Bouagnon to their practice squad Wednesday, Dave Birkett of the Detroit Free Press reports. Analysis: Bouagnon had a stint earlier this season with the Packers' practice squad and will stay within the division and he joins a new organization. He'll provide some extra depth in the backfield for Detroit with Theo Riddick (knee) nursing an injury. Bouagnon was waived by the Packers on Saturday, Josh Tolentino of The Athletic Wisconsin reports. Analysis: Coming into training camp, Bouagnon's best chance to make the 53-man roster was via special teams. The 23-year-old seems like a practice squad candidate in Green Bay should he clear waivers. Bouagnon rushed five times for 10 yards and caught four passes for 27 yards during Friday's preseason game against the Raiders. Analysis: With Devante Mays (hamstring) sidelined all preseason, Bouagnon has received plenty of run behind the regulars in the backfield. 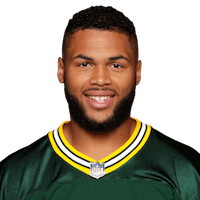 The Packers will likely retain at least four running backs early in the season with Aaron Jones suspended for the first two games, so Bouagnon's availability in the preseason could position him to secure the spot as the third man up behind Jamaal Williams (ankle) and Ty Montgomery (foot) during Jones' ban. Bouagnon had 13 carries for 41 yards in Thursday's preseason game against the Steelers. Analysis: Bouagnon has been quite active during the preseason, totaling 24 carries over two exhibition contests. He has averaged just 2.8 YPC on those attempts, but he remains in the conversation to open the season with a roster spot, as fellow running backs Jamaal Williams (ankle), Aaron Jones (hamstring), and Devante Mays (hamstring) are all banged up. Bouagnon had 11 carries for 25 yards and a touchdown and one reception for three yards in Thursday's preseason opener. Analysis: Bouagnon was the most active of the Packers running backs Thursday, leading the team in carries and yardage. He has an outside shot to make the Packers' Week 1 roster with Aaron Jones set to serve a two-game suspension, but a lot of things would have to happen for him to see work in a regular-season contest this year. There are no videos available for Joel Bouagnon. Click here to view all videos.